The eastern gray squirrel (Sciurus carolinensis) is slender and smaller than the fox squirrel; the fringe of the tail and belly are white; the back and sides of the body are gray (rarely reddish or all black); the total length (tip of nose to tip of tail) reaches 21 inches. Sometimes black individuals occur in the same litter with gray ones; these may be entirely glossy black or show various gradations between black and gray. Albino individuals occur occasionally; in some instances where this characteristic is common in the heredity of a local population, small colonies of albinos may be formed. The eastern fox squirrel (Sciurus niger) is heavy-bodied and larger than the gray squirrel; the fringe of the tail and belly are reddish yellow; the back and sides of the body are reddish yellow mixed with gray (rarely, the body may be all black); the total length (tip of nose to tip of tail) reaches 29 inches. 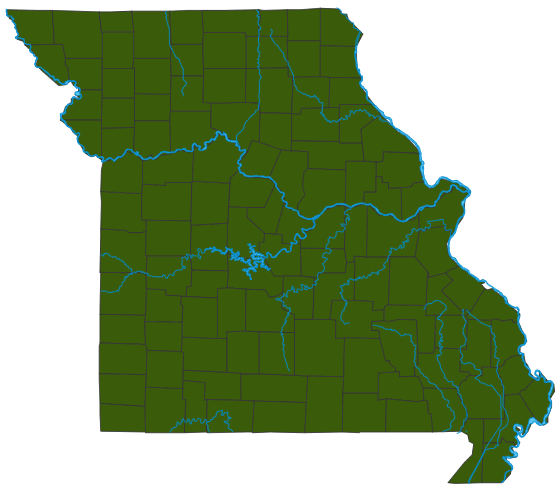 In Missouri, black or albino individuals occur rarely. Total length: 14–21 inches (gray), 19–29 inches (fox); weight: ¾–1½ pounds (gray), 1–3 pounds (fox). A squirrel's home is a leafy nest located in a cavity or fork of a tree. The "grays" are more common in bottomlands and rivers with a bushy understory, and the "foxes" are more common along higher ridges. In the prairie regions of the state, fox squirrels are found along the few remaining Osage orange hedge fences, in farm woodlots, along timbered fence rows, and in timbered draws. Both species also live in urban areas, especially where large oak and hickory trees are common. The foods of squirrels are varied, but of the 100 different species of plants eaten, only a few are important staple sources. These are (1) nuts; (2) fruits and buds of hickory, pecan, walnut, elm, and mulberry trees; and (3) field corn. The importance of acorn and nut crops is shown by the fluctuations in squirrel numbers following years of good or bad mast production. These staple winter foods have an important influence on the physical condition of the females that must produce next year's young. Both of these squirrels occur throughout Missouri, but the gray squirrel is more abundant in the Ozark and Mississippi Lowland region, while the fox squirrel is more common in the northern and western plains. In gray squirrels, the mating period begins in late December or early January and again from late May to early July. Pregnancy requires about 45 days. Most litters are born in February or March, and July or August. A litter comprises 1–8 young, but 2 or 3 are most common. The young are hairless at birth, have their eyes and ears closed, and possess well-developed claws. They come out of the nest for the first time when 6–7 weeks old, and in another week or so they are weaned. In fox squirrels, the cycle is similar, but they begin breeding 10 days to 2 weeks earlier than the grays. From 600,000 to 700,000 squirrels are taken annually in Missouri. Squirrels furnish a large supply of meat each year for Missouri hunters. Squirrels provide considerable pleasure for city dwellers who observe them around their homes and in parks. Automobiles kill many squirrels annually. Economically, squirrels do some harm when they take food from cornfields. They may girdle ornamental trees, particularly in early spring when they gnaw the inner bark. Occasionally, they damage the insulation on outdoor electrical wiring and frequently become a nuisance when they gain access to the attics of homes. Squirrels' habit of storing nuts in the ground results in the eventual germination of many unrecovered nuts.Thus they essentially "plant" nuts that grow into trees that furnish not only food and shelter for subsequent squirrel populations, but also timber of economic value to humans. The many predators of squirrels include coyotes, foxes, domestic cats and dogs, bobcats, raccoons, owls, hawks, and tree-climbing snakes. Hopping pattern has front feet behind hind feet, with each cluster of 4 tracks about 4 inches long. Distance between bounds is 16 inches (varies with pace; running, it may be 30 inches). Gray squirrel tracks are smaller than fox squirrel tracks. Squirrel tracks typically lead from tree to tree. Squirrels often sit on rocks or logs to eat, leaving behind piles of walnut, hickory, and acorn shells. Commonly confused with rabbit tracks.